Among the multiple spaces that conform the Bay Area’s ‘solid world’ and beyond, our intention is to inquire the visual memories related to the liquid space that surrounds land borderlines: the ocean. From a Western perspective, the oceanic space has been historically considered as the ‘other’; an outside deep fluid space premeditatedly separated from the terrestrial spheres. We believe that this imposed binary between solid and fluid territories is a sign of how history and its narrations aim to be shaped as linear and flat discourses and how, on the contrary, our fluctuant memories, dreams, and desires reflect the fluid nature of the ocean waters. This PLACE TALK's Visual Lecture aims to explore Prelinger Library's resources related to the ocean. We’re interested in delving into how the water world has been produced and shaped from the solid world perspective; in searching for presences, absences, and erasures that conform the visual memories latent above, below, and in between the ocean waters. Instead of performing the Library materials by simply compiling visual facts chronologically, our intention is to inquire about those 19th and 20th century fragments that speak directly to the present and re-animate them by aesthetic means. We wonder how and under which forms those traces inscribed in the ocean resurface and appeal to us in the form of images. We are interested in exploring the conditions of visibility of those resurfacings, as well as the discourses and figurations that shape their poetics. Our aim with this visual lecture is to challenge forms of imposed forgetting by encountering the ocean and the collective memories bound to its waters, demonstrating - perhaps - how the maritime spaces are not merely a material neither a metaphorical void. This PLACE TALKS Visual Lecture is concerned with how art-based discourses reclaim the present as a contested territory where the space(s) and their public memorie(s) are experienced. By doing so, The Open Boat talk proposal can be described as an inquiry into the latencies of futures nested within images of the past. In a sense, it means to perceive history not as wood and ashes, but in the living memory of flames, as in Walter Benjamin’s proposition. We believe that to reflect about the ocean space and the visual memories bound to its waters are of utmost importance. To talk with the ocean is to talk through an immense body of water that connects everyone everywhere. As the Kogi people from the Sierra Nevada de Santa Marta (Colombia) refer to it, the ocean is memory and thinking. The below world. She’s alone. Awaiting. Like those memories waiting to be unfolded. PLACE TALKS is a series of visual lectures about location. 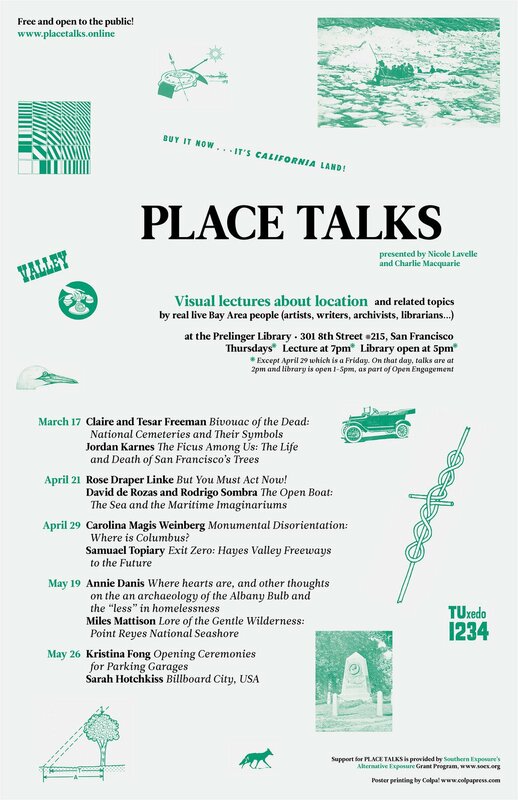 PLACE TALKS is an artist project presented by Nicole Lavelle in partnership with the Prelinger Library in San Francisco and Librarian in Residence Charlie Macquarie.